This is the second year that Andrew and Hannah have planted potatoes. We don’t have a dedicated vegetable garden so they picked a spot that looked promising and planted them right in between a couple of flowering, decorative plants in the front garden. As it happens, potatoes have lovely leaves and pretty flowers. To the unsuspecting, they looked like they belonged right where they were. The first year’s yield was quite impressive as you can see by this photo of a grinning Hannah. This year, Andrew and Hannah added two more locations, but were a little disappointed by the crop. The potatoes were quite a bit smaller. But if we step back a bit, you’ll notice something interesting about this part of the yard. All those big leaves running along the side of the garden bed? Squash. They didn’t plant squash, but there it was. 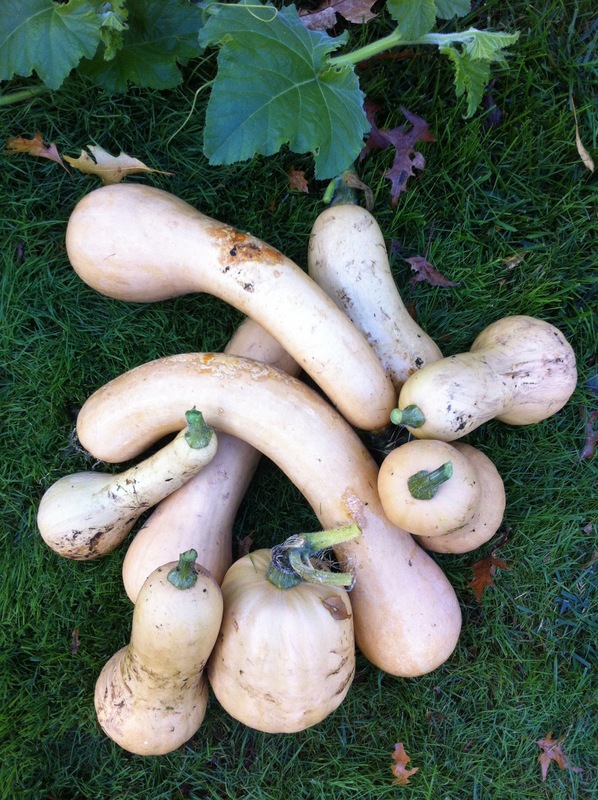 We thought it was a miracle – immaculate conception, squash-style. Only it wasn’t. It was compost. We have a big plastic compost container in the backyard that gets fed all our vegetation and non-meat scraps, as well as all the clippings from Andrew’s pruning projects. It just sits there, quietly rotting away, and every once in a while, Andrew stirs it with a pitchfork looking every inch like one of Macbeth’s witches at his cauldron. Then, when planting season arrives, he puts a healthy supply of his home-grown compost in with the new bulbs or shrubs or what-have-you’s. Last year, Andrew discovered a great recipe in The Boston Globe for pasta with butternut squash, shrimp, feta, and lemon. It was a big hit, and a lot of butternut squash seeds made their way into the compost bin. The rest, as they say, is history. We thought this was an amazing story and shared it with friends. It seems that this was not all that unusual an occurrence. They had grown tomatoes the same way. They called them their volunteer tomatoes. Initially, we thought we had started a pumpkin patch. It wasn’t until the squash blossoms appeared that we realized our mistake. We watched the squash grow from tiny little knobs of green to large, light-orange gourds. 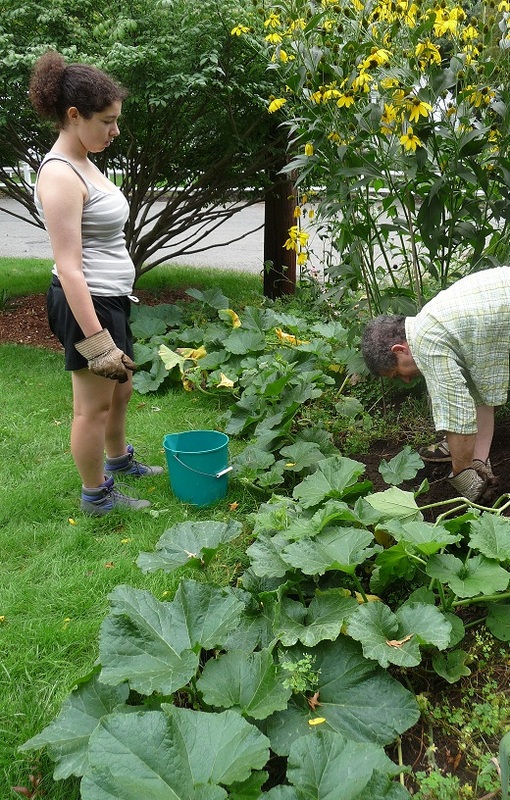 Andrew nurtured them as carefully as anything he ever planted on purpose and last weekend he used our volunteer squash for our favorite pasta recipe. It was delicious. We do, however, have quite a few butternut squash to use. I’m a little concerned that we’ll tire of our favorite dish long before the squash are gone. Volunteer squash, anyone? 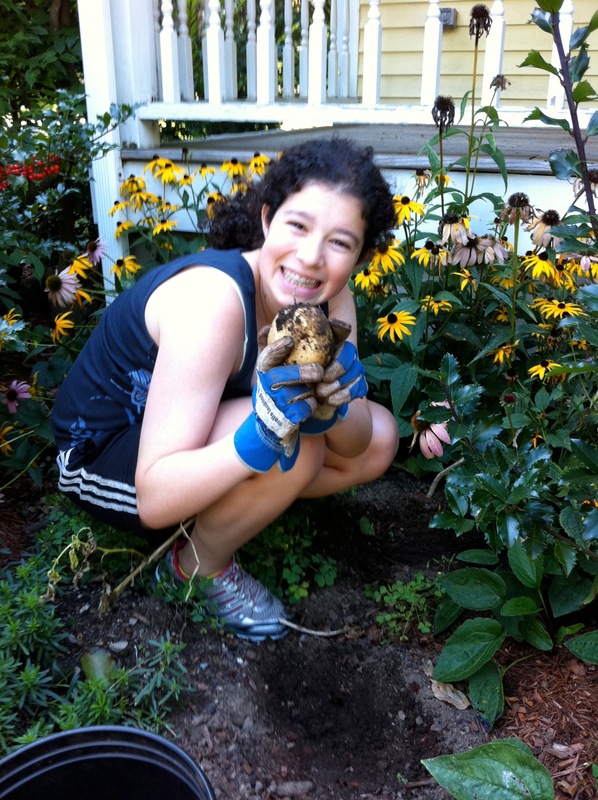 This entry was posted in Uncategorized and tagged Boston Globe, butternut squash, pasta recipe, volunteer vegetables. Bookmark the permalink. Winter squashes love rich, barely composted soil. We actually plant our pumpkin/squash patch right in the compost pile! Cure them by leaving them in the sun for a couple of weeks,. That will toughen the skin a bit. Then you can store them in a cool dry place for up to several months. Thanks for the tips. I’ll check out your blog. Butternut squash and apple soup! Made it last week. Add a little sugar, cider vinegar, and salt to spice it up. I start with a carrots, celery and onion base too, then simmer squash and apple in chicken broth. Cook the squash and put it in bags in the freezer. or just cut it into chunks and freeze it. It will last a long time.